The Hunger Games mixes with The Walking Dead in this post-apocalyptic YA series that comes to a hair-raising conclusion in Monsters. The Changed are on the move. The Spared are out of time. The End...is now. When her parents died, Alex thought things couldn't get much worse—until the doctors found the monster in her head. She headed into the wilderness as a good-bye, to leave everything behind. But then the end of the world happened, and Alex took the first step down a treacherous road of betrayal and terror and death. Now, with no hope of rescue—on the brink of starvation in a winter that just won't quit—she discovers a new and horrifying truth. The Change isn't over. The Changed are still evolving. And...they've had help. 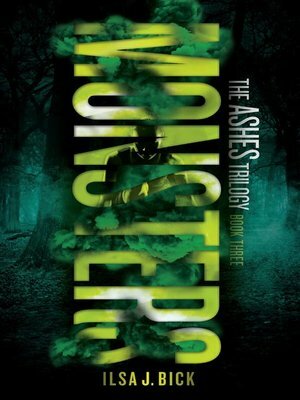 With this final volume of The Ashes Trilogy, Ilsa J. Bick delivers a riveting, blockbuster finish, returning readers to a brutal, post-apocalyptic world where no one is safe and hope is in short supply. A world where, from these ashes, the monsters will rise.